Smeared & Creased: Birthday Smiles! Hello! 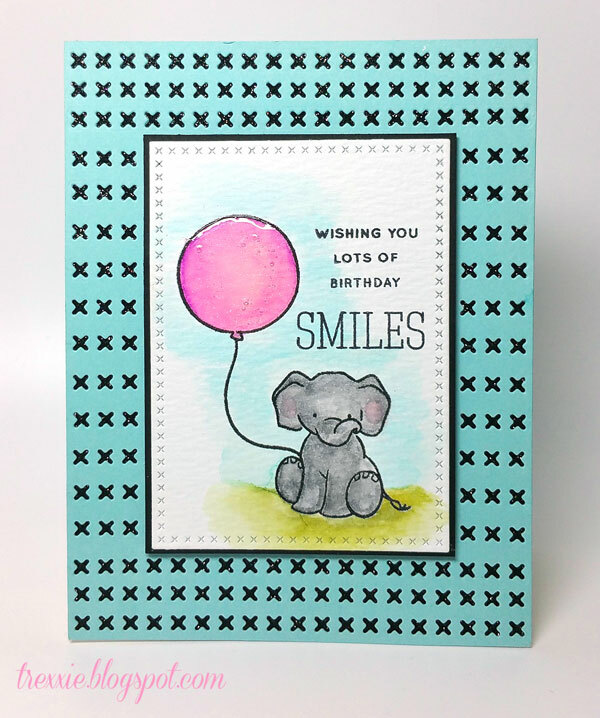 Today I am sharing the sweetest little elephant from the WPlus9 Unforgettable stamp set. Isn't he the cutest?! I used Zig Clean Color Real Brush markers to watercolour the image and covered the balloon with a layer of glossy accents. The rectangle die is from My Favorite Things Cross-Stitch Rectangle Stax and I diecut the background repeatedly with a die from My Favorite Things Blueprints 20. It is not evident in the photo, but the black piece behind is a sheet of sparkly glitter paper which adds more interest to the card. I recognize this Gorgeous Card sitting on my coffee table! It is even more Gorgeous IRL the black sparkle paper looks Amazing. Thankyou so much for my Gorgeous Card!